Camping takes your Cub Scout to exciting adventures into the natural world. Pack camping is family camping where the Cub Scouts learn to live with others in the outdoors. Camping also teaches good citizenship in the outdoors. It is good for the mind, body, and spirit. Cub Scouts learn self reliance, conservation, spiritual growth, sportsmanship, and courage. Most importantly, camping is FUN FUN FUN. Trash bags—good for dirty clothes and rain protection for items. **The Pack has a few gently used tents that can be used by families. To reserve one, please contact the camping chairman for the event to inquire about availability. WANT TO HAVE FUN WHILE CAMPING???? Then remember, NO FOOD IN THE TENTS!!!! *There are only Pack Campfires. There are no individual family fires on Pack events. No firearms are to be brought on camping or hiking activities. Use of alcoholic beverage or controlled substance is prohibited. The use of any form of tobacco products in the presence or view of youth or any other participant is NOT allowed. Only flashlights and/or electric lanterns are permitted in tents. NO FLAMES in tents!!! Campfires will be attended at all times. NO items shall be placed in the fire for disposal purposes. Only adults are allowed to fuel the fire. At no time shall any youth or adult ride in the back of a truck or trailer (except for parades). The beds of trucks must never be used for carrying passengers. Must have a Class I Physical Fitness Health History supplied by the parent for each scout in attendance. Also, each scout must have a Medical Release & Liability Form signed by parent. Release Waiver must be signed for media purposed of any events. Everyone is required to participate in camp inspections. There will be three inspections: (1) after camp is set up, (2) after camp is taken down, & (3) periodically between. The main interest is to ensure a safe livable camp and unembellished site after departure. Don’t leave behind any trace of your visit. Practice LEAVE NO TRACE guidelines at all times. The taking of prescription or over the counter medication is the responsibility of the individual’s parent or guardian. No youth will stay in a tent other than his or her parent or guardian. Parents or guardians are responsible for the supervision of their children at all times and Youth Protection guidelines apply. Youth must respect their leaders and follow their directions. We expect everyone participating to follow the same rules and use manners and respect. Un-scout like conduct or rowdyism will not be tolerated by anyone!!! No profanity should be used by anyone at any time while at a scout function!! Physical violence, hazing, bullying, theft, verbal insults, drugs, and alcohol have no place in the Scouting program and may result in the revocation of a scout’s membership in the unit. Youth may not have a knife in their possession without having on them a valid Whittlin’ Chip card. NO ELECTRONIC DEVICES should be taken on any kind of scouting function. We want the youth to enjoy nature and experience their surroundings. While participating in a scouting function you should enjoy scouts—electronic devices can be enjoyed at the youth’s home. If possible carry out a conservation service project. Buddy System MUST be used at all times during scouting events. For the safety of all involved, NO RUNNING during camping events due to stump holes, tent guidelines, & etc. All activities conducted at camp MUST have 2 deep leadership. No on-on-one contact is ever allowed. 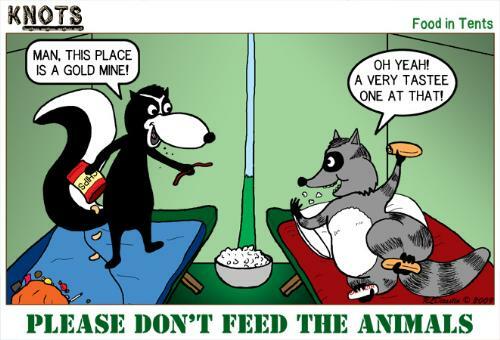 Don’t tease, poke, or chase animals in the camping areas, zoos or in cages. Take care not to startle animals. We are in the animals’ environments and we should respect their environments by leaving the grounds and animals the way we find them!!! No bicycle riding allowed during Pack events unless specified that it is allowed by the Pack (bike rodeos).